NCAA tournament 2013, bracket picks: Act like a hedge-fund manager and pick Florida to win it all. Act like a hedge-fund manager and pick Florida to win it all. 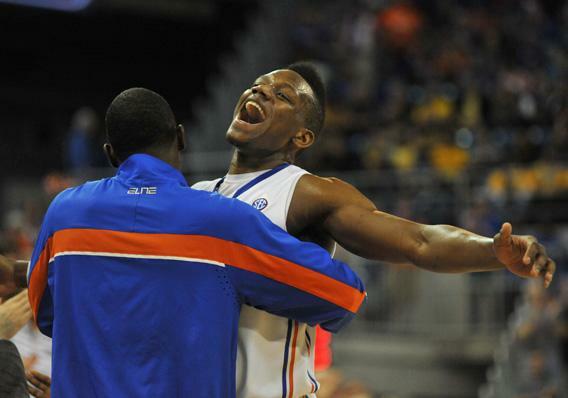 Will Yeguete of the Florida Gators celebrates a victory against the Missouri Tigers. The Gators are the most undervalued asset in the 2012 NCAA Tournament. A version of this article originally ran in 2009. In 2010, our advice to bet on Duke paid off when the Blue Devils won the title. Our suggestions to pick Texas in 2011 and Ohio State in 2012 did not go quite as well. (The Buckeyes at least made the Final Four.) The story has now been updated for the 2013 NCAA Tournament. Read more from Slate’s coverage of the NCAA tournament. For anyone who, like me, merely hopes to survive March Madness with minimal embarrassment, the introduction of wisdom-of-the-crowd statistics to online bracket contests has been pure salvation. Even though I didn’t follow college basketball this winter, I can fake a little competence by basing my picks on what a majority of all entrants think will happen. By copying the “national bracket,” as ESPN calls it, I’ll lose my $5 with dignity. That’s the magic of crowd-sourced bracketology: So long as your office pool is big enough to resemble a cross section of America, you’re unlikely to finish in last place. Of course, you’re also very unlikely to win if you copy everybody else’s picks. Even if you get the last few games right for the big points, a lot of other people will, too. At least one of them will probably be luckier than you. Still, collective wisdom can be eerily powerful in the right circumstances. The national bracket typically performs well, as various commentators have noted, though it will probably win the money in only a very small pool populated by inexpert players. So is there a way to use these collective picks to your advantage while still having a prayer of taking home the pot? As it turns out, the wisdom-of-crowds information is extremely useful. The statisticians and expert bracketologists I talked to all urged one central point: Don’t think about guessing the most games correctly. Instead, think about finding “bargains” in the bracket where collective wisdom runs askance of more objective measurements. Exploiting games where your fellow bracketologists are likely to guess wrong—even if the odds of that happening are still against you—will give you the best shot at jetting ahead of the pack. An NCAA bracket, then, is more like a long-shot stock than a game; the odds of winning may be low, but the big pot makes the gamble worth it—if you know how to maximize your investment. The “contrarian” strategy I’m suggesting here isn’t new; correctly choosing upsets has always given pool jockeys a major boost. What’s changed in the last few years is our ability to value the risk and rewards of a given bet and to decide whether it’s worth it. This bracket-picking strategy isn’t so different from the way Wall Street became obsessed with modeling risk, as Wired has chronicled. The key is having access to two data sets: the wisdom-of-the-crowds data from the national bracket and a table of more objective stats. By comparing the two, you’ll be able to assess whether you’re getting bang for your buck when you throw your lot in with an underdog team. Before you start filling out your bracket, then, you need to choose some measure of team strength that’s free of biases and groupthink. Here, the bountiful Internet does not disappoint. Dabblers can choose from many different statistical measures—adjusted scoring margin, the Ken Pomeroy ratings, Jeff Sagarin’s computer ratings—that rank teams based on factors like strength of schedule and margin of victory. Other services, like BracketBrains, charge a fee for rigorous analysis, factoring in the results of real games between similar pairs of teams, the distance from each team’s home campus, and so forth. Second, you have to steel yourself for the possibility that your pursuit of first place will leave you in last place. While it may get you ridiculed by your friends, it’s important to remember that (at least monetarily) the consequences of coming in dead last are no more severe than coming in a few spots shy of the gold. Act as if you’re a hedge-fund manager in the good old days: Risk is your friend, and the consequences of making a bad bet are small. And unlike with a multibillion-dollar hedge fund, you’re not playing against opponents with equal fidelity to statistics and information. Your office pool is full of people making decisions based on snippets of games they happened to catch and whatever allegiances or vendettas they’re bringing to the table. This is your chance to take advantage. Again, your overall strategy should be to look for situations where the national bracket values a team much higher than the objective statistics. (I should stipulate that all of this advice assumes standard NCAA pool rules, where the points for a correct guess double each round, from one point in what the NCAA calls the “second round” to 32 for the final game.) For example, at the moment only 2.8 percent of all the participants in ESPN’s Tournament Challenge have picked Florida to win the tournament—the right-most column on this table. Pomeroy’s log5 analysis of the tournament, by contrast, gives the Gators a 21 percent chance of winning it all, making them the overall favorite, just ahead of Louisville. This makes Florida a fantastic bargain—while cold-blooded, numerical analysis gives them a roughly 1-in-5 shot at the title, only 1 in 36 people have picked them to win. As such, the Gators are the most undervalued asset in the 2012 NCAA Tournament. On the other hand, Louisville and Indiana—the top two picks on ESPN.com—are not as much of a bargain. In fact, the Cardinals and the Hoosiers are both valued accurately by the crowd. While 20.7 percent of ESPN users like Louisville while Pomeroy’s log5analyis gives them a 20.2 percent shot; Indiana is the pick of 16.8 percent of ESPN’s bracketologists and has a 16.2 percent chance of winning it all. Biostatistician Bradley Carlin, who co-authored a 2005 paper (PDF) on contrarian strategies in NCAA brackets, suggests a “champion-only” technique. While most people spend a lot of time puzzling over potential first-round upsets, the mathematical reality is that it’s difficult to win a pool without securing those boffo championship game points. The payoff for risk-taking also increases in later rounds. Consider the first round game between 14-seed Davidson and three-seed Marquette. Just more than 12 percent of ESPN players predict that Davidson will pull off the big upset, while Pomeroy gives Stephen Curry’s school a 34.2 percent chance of knocking off Marquette. On paper, that differential looks like a great bargain. But consider that this upset will reward the lucky Davidson backer with a mere one extra point in a standard office pool. If Marquette wins, you’re suddenly missing an important player in the bracket. Other than Florida, there aren’t too many great bargains in this year’s field. The next best bet is Gonzaga, which has been picked to win the title by 5.6 percent of ESPN.com competitors but has a 7.5 percent title chance according to Ken Pomeroy. And if you’re looking to back a real long shot, take a look at Pittsburgh (0.1 percent on ESPN.com; 2.3 percent Pomeroy) and Wisconsin (0.9 percent on ESPN.com; 2.3 percent Pomeroy). Who are the worst bets in the field? You’ll get the crummiest value by backing the third-favorite pick of ESPN.com users: Miami (11.4 percent on ESPN.com; 2.0 percent Pomeroy) and Kansas (8.5 percent ESPN.com; 4.2 percent Pomeroy). Duke is a bad bet as well: The Blue Devils are the choice of 8.5 percent of ESPN.com users and have a 4.4 percent chance to win according to Pomeroy. Of course, the trouble with picking an off-the-radar champ is that the benefits of such a strategy materialize only in the long term. Another author of that 2005 paper on bracket strategies, Jarad Niemi, told me that he has won back three to four times his investment in entry fees over the years, but a great deal of that came from a good year in 2008. (Considering how good they are at calculating risk, it’s no surprise that guys like Niemi and Carlin excel in pools that award bonus points for upsets. Carlin said he won one such pool three out of five years.) A strategy that wins you a lot of money a small amount of the time may work well in sports with long seasons, but it can be tough to keep the faith when you finish in the cellar for six straight Marches. But look at it this way: Did you ever win with your old strategy? Read more from Slate’s coverage of the NCAA tournament.